When your favourite planner retires and you reminisce about how great they were and wonder how you’ll move on without them…. that’s me every time I look at this wedding. Jaclyn with 6Pence was a gem in the industry (she did my own wedding too) but has moved on to open a new business with her husband doing custom homes and renovations. Hello Heirloom Projects. On that note, now I feel like I should suggest an another amazing planner who is in business. Do yourself a favour and reach out to Erin at Filosophi if that’s what you’re currently searching for. Speaking of amazing vendors, the florals at this relaxed summer backyard wedding were done by Floralista out of Fort Langley. But I digress. Like, a lot. 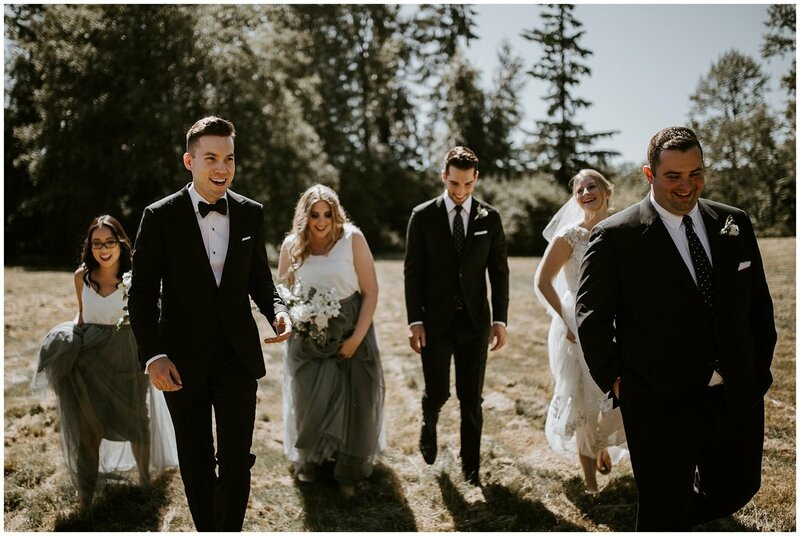 Back on topic, like I mentioned, this relaxed summer wedding took place in the prettiest backyard not far from Fort Langley. The bride and groom did a first look at the house then we snuck off to Campbell Valley for portraits in the shade before returning for the ceremony. The reception took place poolside in a beautifully decorated tent and we did another round of photos durning one of the best golden hours that I witnessed this season. Great food, pretty light, lots of dancing.